SLAYDIES SERIES SPOTLIGHT! REBECCA LUTZ / CALLSIGN_GLITTERBOMB! Hi everyone and welcome to another instalment of the FFA Slaydies Series Spotlights! In this spotlight I talk to a Slaydie from New York USA who can hold her own and has a positive message for new Slaydies! Hi Rebecca! 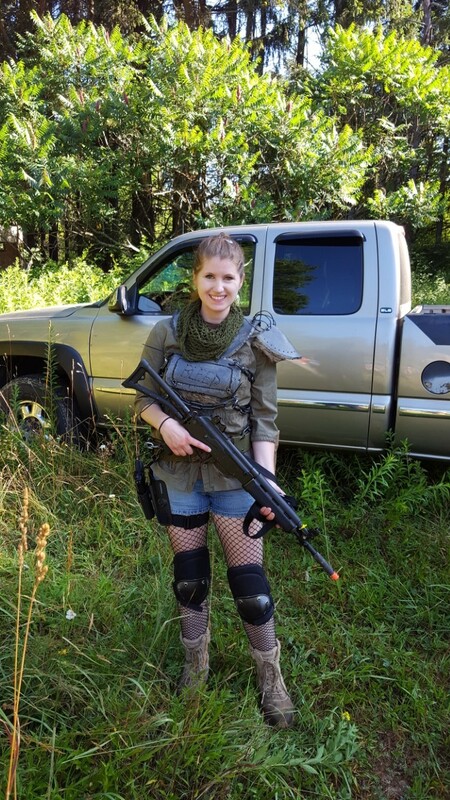 Thank you for taking part in the Femme Fatale Airsoft Slaydies Series Spotlights! Please can you tell my readers some information about yourself? My name is Becca. Callsign Glitterbomb. I'm 26 and from Western New York USA. I'm a registered nurse working in a level IV NICU. I'm also a lover of cats, playing video games, and crocheting like an old lady. I've been Airsofting for a little over 8 years. I was first introduced to Airsoft when I met my boyfriend (now husband) in the summer of 2008. Before that I never knew such a thing existed. I grew up around real steel firearms and I'd played paintball before but was oblivious to the world of Airsoft. I went to my first game in summer 2008 in borrowed gear with a beat up old MP5 and I loved every second of it. I've since become an active member of a MilSim team and now play regularly. My favourite aspects of Airsoft are the teamwork, camaraderie, the physical challenges, and the feeling of accomplishment when I get a great kill or when I secure an objective. 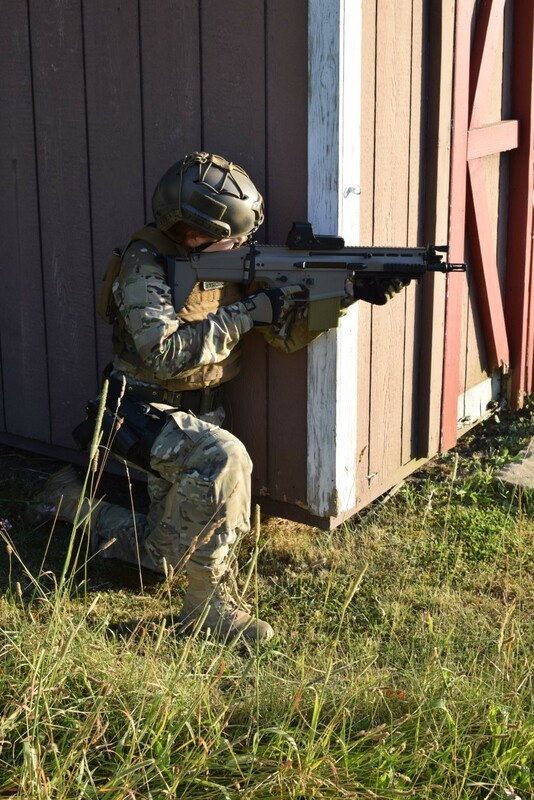 Though I'm part of a MilSim team, I play for the fun of it all. I play most often at River City Airsoft in Hamlin NY. Other local fields I very much enjoy are Hunter's Creek Airsoft and Buffalo Battleground. My most memorable sites are Ransomeville National Guard training site and Fort Drum NY. This October I'm thrilled to be attending my first MilSim West game at the Guardian Centres in Georgia which looks like the most incredible AO I may ever play at. I am typically in the rifle Woman role and occasionally a medic. My team play themed games in which I will get much more into character. For example this past year I've played the part of "drug lord's daughter" in a Cartel themed game (complete with leopard print pants and gold bling) and I was played a raider in a Fallout game. I enjoy outdoor games more than CQB but we get harsh winters here so I do a lot of indoor CQB from October to May. Let's talk weapons and loadouts! What do you usually run? Depending on the type of event I'm playing at, I'll either be using my GHK G5 (my favourite!) My Echo 1 Scar H, or my GK 95. I'll wear either my Emerson JPC or a condor chest rig with my Emerson G3 combat set. I've got an IMI defence holster for my USP compact. I'll wear either my Emerson PJ Fast helmet or just a plain old baseball hat with some cheap full seal 3M safety glasses (somehow they're the best I've ever used at preventing fog). For gloves, I use SKD FDT pig charlies and I wear Rothco deployment boots. For comms, I've got a Baofeng radio. 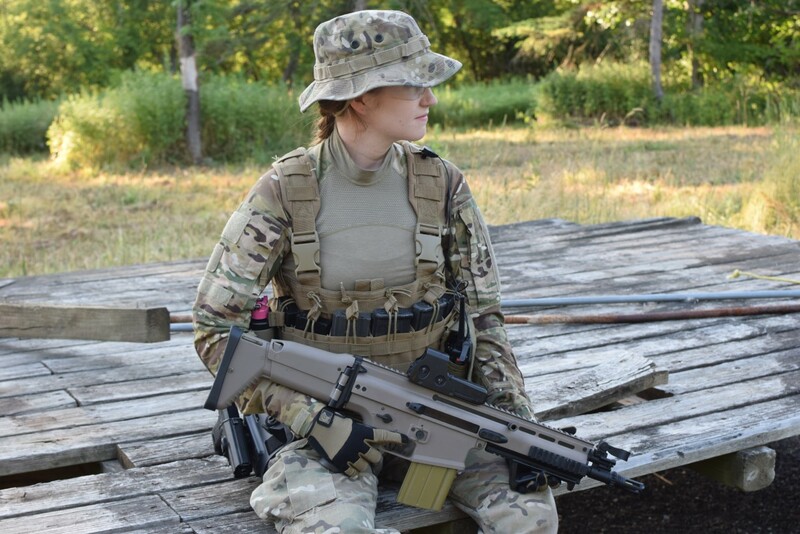 Being a women in Airsoft, what are you thoughts? Women in Airsoft are on the rise. I wish the industry would recognise this and start making more gear and equipment that will accommodation our needs. Examples being lack of well fitting mesh face protection and adequately sized plate carriers/chest rigs. Even just finding gloves that are both protective and small enough for my hands has been a challenge. 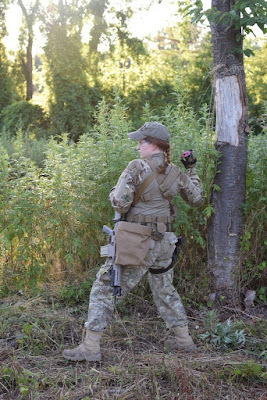 In regards to how other players respond to my presence, I personally feel I've been very fortunate as a woman in Airsoft. I've never experienced any discrimination from the group I play with. I hold my own. If players who don't know me underestimate me because of my gender, I am happy to prove them wrong. Do you have anything you'd like to say to other players out there? To other players out there: Have fun and be safe. Treat other players respectfully. At the end of the day, this is a game. To women who are new to the sport or who are nervous because you're in the minority: Be confident. If you act like you know what you're doing, you'll instantly gain respect from those around you. Do not tolerate harassment. You have just as much a right to be there and enjoy yourself as anyone else there.